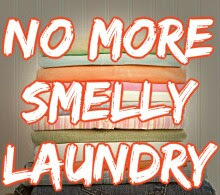 Here is an all natural tip on how to remove smell from laundry. Getting rid of musty laundry is easy. Has anyone else ever been faced with this problem? You wash and dry your laundry and then you pull a t-shirt out of the drawer, slip it on and go, "Phew who let the dog in? And did she roll in poop?" Well, everyone in this house has. It was becoming a common problem of clothes coming out of the laundry stinky. Didn't matter if I used my homemade soap or bought soap. The result was the same. Now you can blame it on the six stinky people in our house, or the dog beds I wash weekly or my lineman's filthy work clothes, but something was causing the stink. The easiest solution is to add a little vinegar to the rinse cycle. That's it. I pour about two tablespoons into the fabric softener holder and it never fails; clean smelling washer and laundry. You may smell a little vinegar in the washing machine but you do not smell vinegar in your clothing at all. Cheap and simple solution to my conundrum. I have also read that the vinegar acts as a natural fabric softener. Also, if you happen to forget a load of wet laundry in the washing machine and you have smelly laundry, just add some vinegar and run through just a rinse cycle and that is how you quickly deal with smelly laundry.